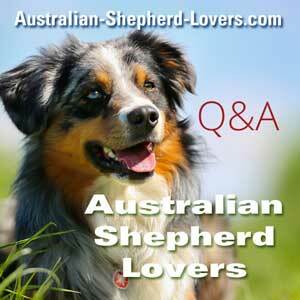 We have a male rescue Australian Shepherd who has behavior traits that we are concerned about. He lives primarily outside with a dog door to the utility room where he eats and sleeps, rests, etc. We have a large fenced front and backyard for him to run. The problem is he is good with my husband and others inside the house but when he is outside he will not let my husband or others pet him. He comes close but not actual petting. He also has bitten my husband multiple times when he is in his shop or working in the yard. He does not like power tools or mowers and weed eaters, now even if my husband rolls the car jack around in the shop he bites him. Last bite was on the knee and it is badly bruised. We have had him for a year and a half now so my husband has tolerated well but we have to stop this behavior. All suggestions are appreciated. Hi I would like to suggest using a long lead when dog is outside so he can easily be corrected or introduced when your husband goes outside to yard while he’s out. Having your husband bring a very desirable treat in his pocket while you get control of leash and have him in a sitting position. I feel your rescue must know who is boss and positive reinforcement is what I find the best way to teach. Leash training is a must which will (I think) help with the craziness when someone is entering your rescue's territory. Never reward if behavior isn’t going in the direction that you want. Even take a breath turn your back to him and try again until he responds to your command. Thanks for the advice. We do treat him well, maybe too much, we will treat only for positive reinforcement and see if it helps. Hi, you said your Aussie was a rescue and only behaves badly outside. It's possible that he had a bad experience outdoors, or even more than one, before you got him and he is lashing out in fear every time someone invades his space. I agree with the leash training suggested earlier, but also TONS of positive reinforcements when he is outside with you or anyone. As for the power tools, lawn mower, etc. that could just be an Aussie-fear thing. My youngest Aussie absolutely trembles/shakes whenever we use an indoor electric grinder that we have. And my older Aussie took years to adjust to our vacuum cleaner. I would let your pup come inside when your husband is using those tools. He's needs reassurance that the super loud thing that just started up is not going to hurt him. Maybe cuddle your furry friend while your hubby mows the yard?